Now apologies if I am telling you something you already know. I've only been digi since January of this year, so I am still "discovering" these things. I have been trying to make sure I can somehow replicate or capture my traditional supplies. 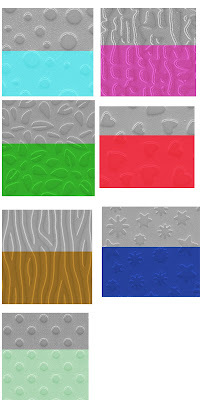 If you have an emobssing system and you have the texture plates, well you can use them for digi. I scanned in the plates, removed the colour and saved them as JPGs at a high DPI, and I can use them as texture overlays for digi. It is also a lot easier than the traditional way of embossing paper LOL. Not sure that this image does it justice, but have a play ! Back to the work - he has finished playing with the electric hedger (Vicki you are right about men and power tools) and now we need to do a trip to the tip with the offcuts. And stop at a nursery on the way back for my plants. LMAO - not quite, Casper just won't sit still on the scanner LOL. You did see my comment the other day about trying to scan curtain hooks. At least I'm not putting food ont here again (yet LOL). I wanted to get the ice cream cone texture and was thinking of embossing some paper and then scanning that, and thankfully I tried just scanning the template first. Woo hoo. Are you sure you don't need me to carry that suitcase ?? Are we supposed to be able to download the textures? If so, I can't figure out how. I tried clicking on the picture and on the title. I couldn't find any links within the text either.